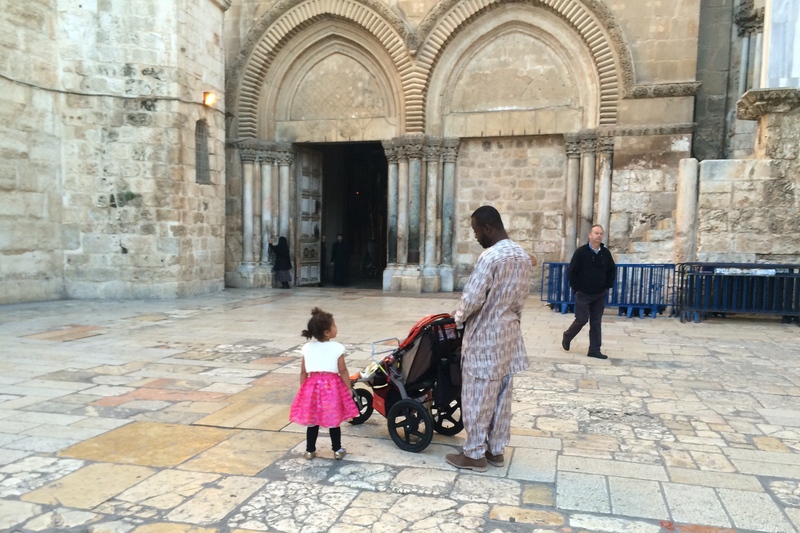 On Easter morning, we got up before dawn, dressed the girls, and drove downtown for Easter Mass at the Church of the Holy Sepulchre. What could be more spiritual than Easter in Jerusalem, supposedly on the spot where Jesus was crucified two thousand years ago? But it was a good adventure, and we’d definite recommend it to anyone without young children. The church was deserted when we arrived — part of the reason we got there so early. Once we got downtown (the city was deserted that early), we parked at the Consulate (yes, that’s one of the perks of working for the Americans—free parking in downtown Jerusalem on a Sunday morning), and walked to the Old City. We entered through Jaffa gate, and made our way through the deserted Souk to the church. We arrived at the church around 7:00, and started asking where the Catholic mass would take place. The church is shared by Catholics, Syriacs, Armenian, and Greek Orthodox, so we wanted to make sure we were sitting in the right place. We found some wooden benches, and sat down with Jasmine in my lap, Bertrand to my right, and Grace still in the stroller (where she miraculously stayed until the service was almost finished). The church slowly filled, and a Syriac mass began behind us. We quickly discovered that we’d chosen our seats poorly—the Syriacs had to walk through our aisle in order to touch the edifice in the middle of the church as part of their prayers. Oops! We were pretty easy going about it, much more so than the folks around us, and just pushed our bench back a foot or so to make room (it was standing room only behind us). About two hours into the mass, a young man came through, shouting at us to get up! And move! We did, and he pushed the benches out of the way so that the Catholics could make their procession around the the church. Previous to that, sitting and standing with Jasmine was no problem, but once we found ourselves without seats and pushed into the crowd, the experience was much less fun with children. Folks who’d previously been very kind about our stroller made several nasty comments, and, as we were pushed and jostled and Jasmine protested, we got a few comments about the noise as well. Eventually, we just decided to leave. We couldn’t see, I was carrying Jasmine (who is getting big), and frankly, another hour of watching the Catholics march around the church and sing while being pushed and shoved in every direction didn’t seem like a terriblly spiritual experience for Bertrand or I. With the help of some lovely Syriacs, we lifted the stroller over the barriers, and pushed our way out of the church. Perhaps the coolest part of the whole experience was listening to the three different Christian services going on at the same time in the church. It’s true that the different sects get along so poorly that they had to designate a Muslim family to hold the keys to the church, but at the same time, the fact that they somehow manage to share the space at all in a city as fractious as Jerusalem is beautiful to me. Post service snacks in the old city — pizza and calzones. After the service, we drove down to First Station to meet another family for brunch, and had a lovely time letting the kids run around like morons. Not only was the food delicious, but there were tons of events going on for the kids, like live musicians and face painting. One of the very real advantages of being in Jerusalem with Easter overlapping with Passover.